Audi A3 cab wins women's accolade | What Car? 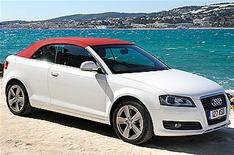 The Audi A3 Cabriolet has been named Car of The Year by women's car-buying website evecars.com. Women influence over 80% of car purchases in the UK and these awards focus on what women really look for in a car, to help them make the perfect choice, whatever their lifestyle. Alex Jenner-Fust, editor of evecars.com said: 'The Audi A3 won over all the judges with its impressive combination of talents. 'It looks great: it's neither too feminine nor flashy, but classy and well styled. It's easy enough to get a child seat in the back and the soft-top roof leaves more boot space than a folding hard top. The Audi A3 Cabriolet topped a shortlist of 27 cars across eight categories selected from over 3000 models on sale in the UK today. Two well-loved British-built brands won over the judges, with the Land Rover Discovery taking the 4x4 award and the Jaguar XF collecting the Executive award. The BMW 318d won the Green award for its combination of energy-saving technologies including 'Auto Start-Stop' that switches the engine off when the car comes to a halt. When the driver's ready to roll, simply putting the car into gear starts the engine again. 'The BMW 318d is a great car; it's kind to the environment, and huge fun to drive as well as being practical,' said Jenner-Fust. Fiat's retro-inspired 500 won the city car category: judges found it surprisingly roomy and were impressed by the thousands of optional extras available to help owners personalise the car. The MPV category was topped for the second year running by the Citroen C4 Grand Picasso, which still leads the pack for its combination of style and versatility. Audi's TT scooped the best Sports car award, while the Hyundai i30 was the Small family car category winner. For more on evecars.com, click here.